Throughout the month of January, the 023 Gallery will be hosting Being Present. This exhibit is one piece of a two-part series and features local artist and scholar Mary Grace Bernard. During these performances, the 023 Gallery will become Mary Grace Bernard’s living room open to visitors to practice self-care and engage with the space during and in between performances. There will be four performances in which Mary Grace Bernard will play with the extreme private moments of life and extreme public moments. The space will also be open to visitors unable to attend virtually via their website. 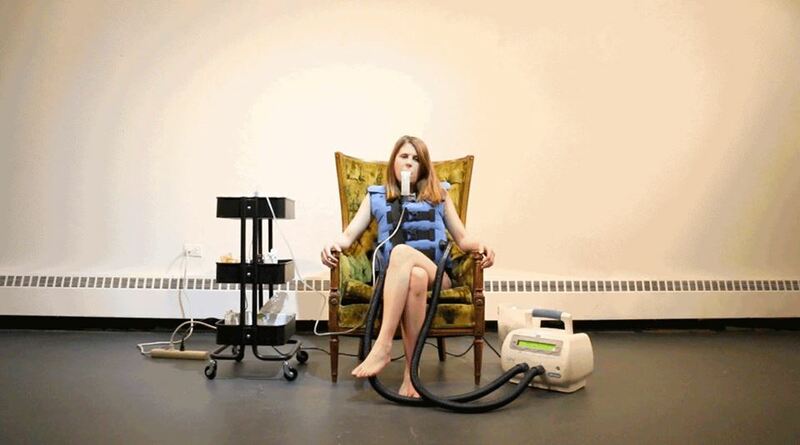 Mary Grace Bernard lives with cystic fibrosis and uses art theory and art practice to make the invisible visible. More on Mary Grace Bernard’s story and bold performance and research will be shared in an upcoming issue! For now, come and view the performance and enjoy the living room-esque space. Opening Reception: Jan 10, 6-9 p.m. Performances: Jan 10, 17, 18, 24, 7 p.m.
023 Gallery is located at 2121 East Asbury Ave on the University of Denver’s Art Department. Emily Creek is a cultural anthropologist, originally from Wisconsin who received her MA from the University of Denver. She studied dance and performance art in the Nordic region with a mixed methodology of participating in performances, interviewing, and using various theoretical frameworks. While in Iceland, she worked and performed with French Musician Gérald Kuridan and the Reykjavik edition of the Hot Bodies of the Future Choir, an international network of feminist choirs. She also had the opportunity to perform in a piece titled "Mothership" by Icelandic performance artist Anna Kolfinna Kurna, a piece that combats cat-calling in the street. She is excited to engage with Denver artists and share their stories with the city, and believes that there is no work more rewarding than exploring the role of art in everyday lives.